Residence Sharq ... located within the $1.6-billion Dilmunia project. Bahrain’s Al Ma’awdah Group has named Impact Estate as the sales and marketing agent for its multi-million-dollar waterfront project, Residence Sharq. The freehold development, which enjoys a prime location within the $1.6-billion Dilmunia ‘health island’ masterplan, is a low-rise multi-level complex with 282 spacious one-, two-, three- and four-bedroom luxury apartments, townhouses and villas. Impact Estate will provide a full range of services including the project launch, marketing and post-sale activities. Residence Sharq is scheduled for completion in 2019. Designed by Unanime, a French architectural firm headquartered in Lyon, Residence Sharq combines European elegance with a laid-back waterfront lifestyle. The project boasts spacious units with panoramic views and natural lighting. It offers high-end luxury units with areas starting from 101 sq m for one-bedroom apartments, and going up to 339 sq m for four-bedroom townhouses. The project will commence construction in the fourth quarter of this year, says Oksana Konyshevska, Impact Estate general manager. “All units will be sold with fully equipped kitchen and high-standard fitted bathrooms. Al-Ma’awdah Group is a well-known name in Bahrain’s construction and real estate development industry, having participated in or led a number of major residential and urban projects within the kingdom over the past 35 years,” she notes. 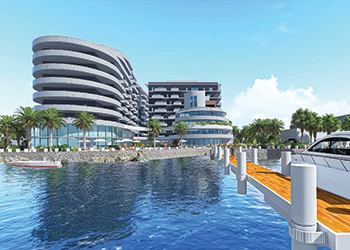 The project provides residents with quiet, yet luxurious, seafront lifestyles. It features landscaped gardens, a common gym and infinity pool, a women-only gym and infinity pool, a 500-m track, and a seaside cafe.